Work will start next week to carry out £500,000 worth of improvements to two footbridges over the railway line in Motherwell. The bridges at Ladywell Road and Logans Road will be closed from Monday until the work is completed on Friday, June 12. Back in 2012 Motherwell Local Area Partnership (LAP) wrote to Network Rail demanding action at the town’s crumbling footbridges, but were told they would need to wait until around 2017 before Motherwell was put on the schedule. In the meantime the council took it upon itself to spend £11,000 resurfacing the Ladywell bridge, which connects Muir Street and High Road, as it was so potholed it was becoming difficult to negotiate. 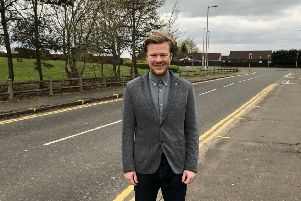 Motherwell West councillor Michael Ross had been calling for action long before then and is delighted it is finally happening. He said: “Going back to 2008 I have been calling for something to be done about these bridges so I’m pleased that finally work is due to start. “We were told at the LAP it would probably be 2017 before any happened so I am glad they have managed to fit us into the schedule two years earlier than that, although they probably tell us one date so we’ll be delighted when it happens before that. “I remember there was even an offer for the council to pay for the work to be carried out just so it would be done, but of course I’m happy that in the end the funding hasn’t had to come from the council budget. “Once this work is carried out the council does still have a responsibility to ensure the bridges are maintained, as there is no point is carrying out work only to let them fall back into rack and ruin. The programme of works is as follows: Monday to Friday from 7.30am-6pm, Saturday from 10pm-10am and Sunday from 10pm-7am. In addition, 24-hour continuous working will take place over the weekends from May 1-4, May 8-11 and May 15-18. In a letter to local residents Network Rail said: “We understand that working overnight is far from ideal, but we are legally obliged to work on the railway at times that cause least disruption to trains. “Unfortunately this means carrying out a lot of our work at weekends or overnight. A 24-hour helpline is available on 03457 11 41 41.